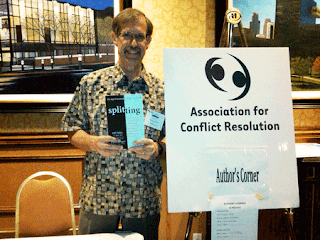 I just finished attending a national conference of Family Mediators in Minneapolis (for the Association for Conflict Resolution). It was a lively conference, with several leaders of the family mediation and divorce mediation fields for the past 30 plus years in attendance. There is a strong commitment to increasing public awareness of mediation as a much better alternative to litigation in many areas – and especially for family matters that include children, such as divorce. I gave a seminar on managing “high-conflict” clients in divorce, who often have traits of borderline or narcissistic personality disorders. Not all people with these disorders are high-conflict people, but when these disorders are present it can be a much more difficult, angry and prolonged process of divorce. Mediation is one method of helping calm and structure the process so that children are kept out of the conflict and the parents can feel respected and in control of the decision-making – with guidance and limits from the mediator. · Many times, only one person is “high conflict” and the other person is reasonable and just trying to manage the situation. This knowledge helps mediators not make assumptions and helps reasonable people feel understood for what they are going through. · Mediators can help high-conflict people stay calm and less defensive, by steering clear of blaming and focusing them on tasks and the future. · Mediators help parents work together by teaching them how to make proposals and how to communicate using the BIFF method (Brief, Informative, Friendly and Firm) for emails and other communications. · Even mediation has limits: If there is bullying that doesn’t stop, if there are rigid positions by one side, if one person is hiding assets or unwilling to share assets, then mediation may need to be stopped and the family may have to go to court. The mediation process is based on mutual respect and doesn’t work without enough respect. · With well-trained mediators, most high-conflict people can reach reasonable agreements. Although it often takes longer, the mediation approach tends to leave people better off for years to come. Of course, after the conference I couldn’t help noticing the similarities of high-conflict divorce with the news of the debt ceiling crisis in congress: rigid positions with little empathy for the other side, lots of all-or-nothing thinking, lots of blaming and high-risk behavior. Just like in a high-conflict divorce, it was hard to tell if there was only one high-conflict party or two. And just like in a high-conflict divorce, the high-conflict behavior of one or both caused the rest of the family (the voters) to have less respect for both of them. I’m not sure if my new book will help congress, but if you are facing a possible high-conflict divorce, I encourage you to read: SPLITTING: Protecting Yourself While Divorcing Someone with Borderline or Narcissistic Personality Disorder. It can be helpful at any time before, during or after the divorce.